The exterior of the Basilica is constructed almost entirely of white marble, from the Georgia Marble Company of Tate, Georgia. Additionally, forty-six different types and colors of Italian marble can be found throughout the Basilica's interior and exterior. Perhaps the most prominent feature of the Basilica's exterior is its huge copper dome. 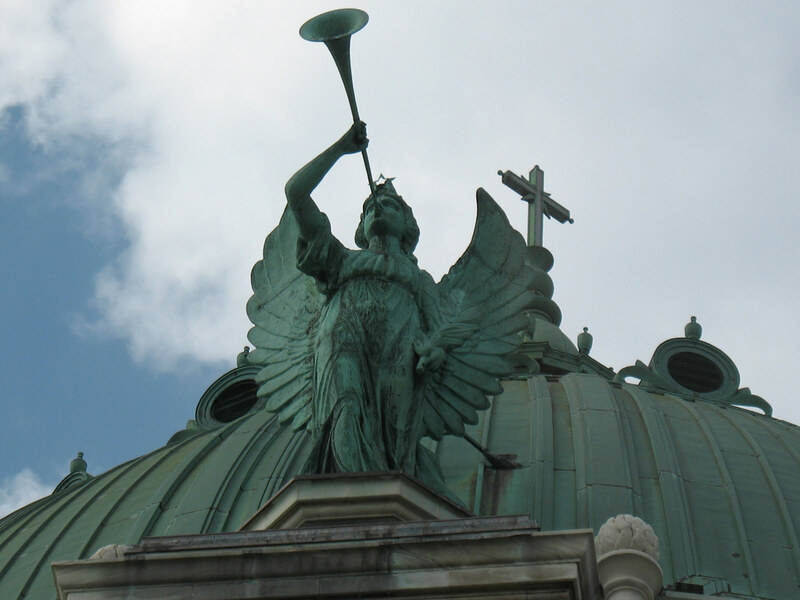 Measuring 165 feet in height and 80 feet in diameter, at the time of its completion the dome was second in size to the U.S. Capitol building in Washington, D.C.
On the dome, four copper angels, each 18 feet tall, sound their trumpets in the directions of the compass. The large colonnades that extend outwards from the entrance each feature a marble sculpture of a group of children protected by a guardian angel. On the east colonnade, the children are led by a nun, representing the Sisters of St. Joseph, the order which has staffed the OLV Institutions since 1857. The west colonnade features Father Baker, and was the subject of some controversy at its unveiling. For weeks prior to completion of the Shrine, Father Baker's assistants and Emile Ulrich had been meeting in secret to alter plans for the west colonnade. After the statute was completed and placed atop the structure, Father Baker was angered and embarrassed to see his own image! Produced completely without his knowledge, it took much debate and convincing before Father Baker relented and allowed his likeness to remain. 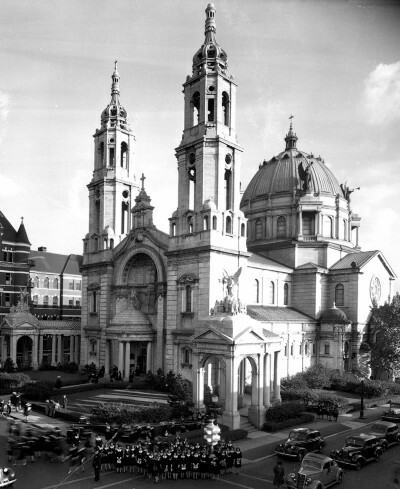 When the Basilica was completed in 1926, its twin towers rose into the sky at an impressive height of 165 feet (more than 16 stories). The original spires were made completely of marble and had an open design. However, in 1941, a freak and violent lightning storm caused major damage to both the towers, forcing them to have to be redesigned and refurbished. The new towers still stand today and feature a design which mirrors the Basilica's Great Dome, topping the twin structures with copper domes of their own. Both are enclosed and are much shorter than the original towers. 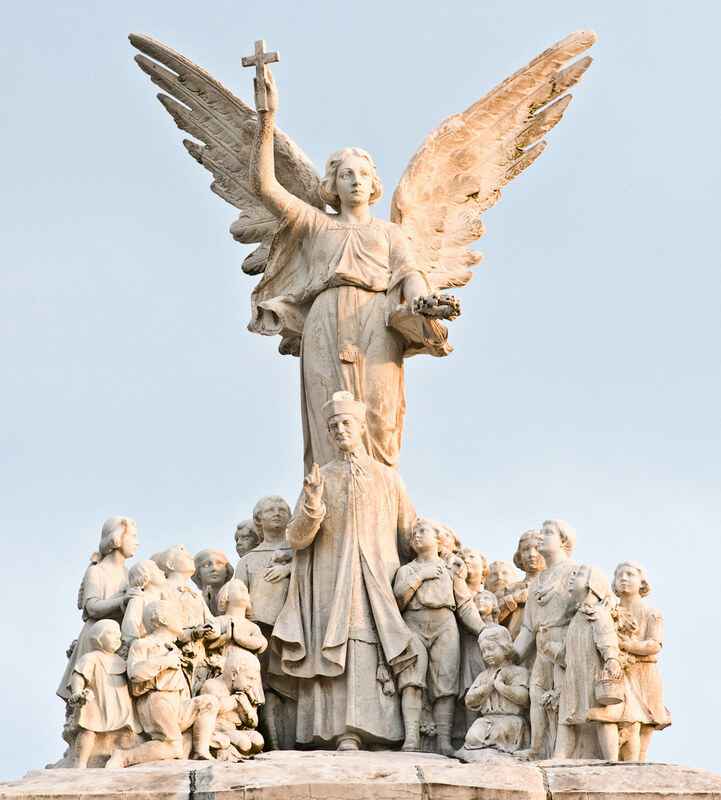 The main entrance to the Basilica features a domed niche that houses a 12-foot-tall, 8-ton statue of Our Lady of Victory.